Thanks to a grant from Marin County Parks, the Bridging Generations program is going out into nature this Spring. Here are some photos from the first trip at McNear’s Beach (special thanks to photographer John Nelson who volunteered his time and artistry). 3rd grade students and their Senior Buddies heard from Ranger Nova about the animals and fauna in the area, then they planted some of their own fauna in self-decorated pots and finished up with a picnic together. It was a great day! Two other groups will be going out in April. Bridging Generations sessions are always fun, even more so when puppies are added! 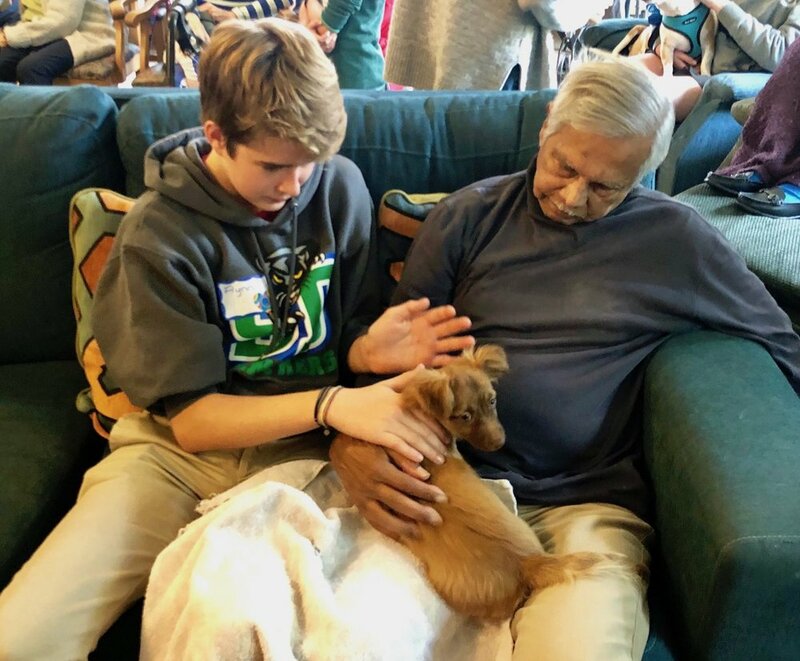 The students from San Domenico were wonderful buddies for Bello Gardens Assisted Living residents, making sure they could all enjoy the puppies Jessica's Haven and Rescue brought and even decorating the tree in the activity room. Read and share this summary document or take a look at the full study. LITA and our partnering facilities are excited to have new 2nd through 8th grade students, including San Domenico Middle School's Service Learning Club and Dixie Elementary’s 4th & 5th grade. Some of our returning participating schools are starting their 10th or 11th year of the program. We hope they have an exciting, meaningful year as they bring joy to seniors throughout Marin! LITA was awarded a SPROUTS grant from the Marin County Parks department to explore having Bridging Generations' sessions in one of our wonderful county parks. It is a great way to encourage even more connection and shared experiences between the students and residents.